Piper has gone from daring rarity to mainstream darling. Thanks to Kayt for suggesting today’s Baby Name of the Day. In 2008, I wrote: Piper is one of those fabulous names, long underused, that is set to soar. That’s certainly come to pass. But this name takes to the skies for another reason. Since the 1930s, Piper Aircraft has been known for manufacturing small airplanes. Tens of thousands of aircraft manufactured by the company are still flying. The company was named for founder William T. Piper, Sr., known as the Henry Ford of aviation. 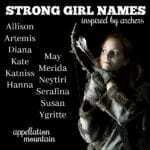 This puts the name in the company of Jett, and maybe nature names like Skye, too. Originally, this started out as a surname for a musician who played the pipes. It ultimately comes from the Latin pipare – to peep. It’s imitative – an attempt to replicate the sound. The name is on trend for so many reasons. 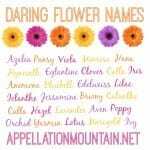 File it with the tailored surname names, just like Sloane and Hadley. We do love a good musical name, like Lyric or Aria. 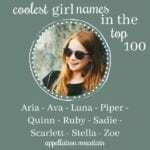 For boys and girls alike, ends-with-r surnames continue to appeal, from Carter to Harper. Most of us have piper nigrum in our kitchens – black pepper – making this a spice name and a nature name, too. Of course, we don’t know the name of the most famous piper of all time. He’s the Pied Piper of Hamelin, a medieval legend. The basic story goes like this: the German town of Hamelin has been overrun by rats. A musician agreed to rid the town of its pests for a price. He succeeded, playing his pipe to lure the rats to the river, where they drowned. But the townsfolk balked, and refused to pay as promised. So the stranger played another tune, and lured away all of the town’s children. Scholars debate whether the tale has its roots in some real-life tragedy. But it lends another aspect to this name. It’s a sad story, of course, but I don’t think it’s a deal-breaker. After all, plenty of other people have answered to the last name over the years, and the musical association is a strongly positive one. We expect any surname to enjoy some use as a given name, especially for boys. But that wasn’t the case for Piper. Instead, this one started out exclusively as a girl’s name, and it owes its creation to Hollywood. Way back in the 1940s, Rosetta Jacobs signed with Universal Studios. Rosetta became Piper Laurie. Her career spanned decades, as she racked up Oscar and Emmy nominations from the 1960s into the 1990s. She’s still acting today. Laurie’s unusual stage name inspired namesakes almost immediately. It was used in small numbers by the 1950s, and while it never really took off, it held steady through the years. In the 1990s, this name jumped in use, debuting in the Top 1000 in 1999. What explains the leap? In 1998, Aaron Spelling’s Charmed introduced us to the bewitching Halliwell sisters: Prue, Piper, and Phoebe. The WB series followed their lives in San Francisco, as they used their powers for good – and tried to keep it all a secret. The series ran for eight seasons, plenty of time to take the name into wider use. It helped that we were all about surname names for girls at the time. The US Top 100 in 1999 included Madison and Mackenzie, Taylor and Bailey. Some credit goes to actor Piper Perabo, an early Laurie namesake. She played Jersey in Coyote Ugly way back in 2000, but her star turn came in 2010, when she starred as CIA operative Annie Walker in USA Network’s Covert Affairs. But it was took another real-life woman with the name to take it into the Top 100. That’s Piper Kerman, the inspiration for Taylor Schilling’s character in acclaimed Netflix series Orange is the New Black. The prison comedy-drama has racked up tons of awards since its 2013 debut. It’s also pushed the main character’s name right into the spotlight. Strictly speaking, Piper cracked the Top 100 in 2012, a year before the Netflix series’ debut. But the name gained steadily in use in 2013 and 2014, suggesting the show deserves credit for much of the name’s success. Even with Orange, Piper might’ve followed Harper and Penelope into wider use. It has hit a plateau in recent years, but I still think this name feels fresh. Cool. It’s the kind of name that feels right at home today, as perfect for the early twenty-first century as Betty was for the middle of the twentieth. It’s a solid choice for a daughter, feminine but tailored, with just enough history to keep from feeling made-up. What do you think of Piper? Will this name continue to rise? This post was originally published on May 31, 2008. It was revised substantially and re-posted on November 17, 2014, and again on December 12, 2018. I love Piper (how cute is Pip?!) and it still feels a little bit edgy here in the UK, despite shooting up the rankings since the release of OITNB in 2013. I might love Fifer a little bit more, though! The only Piper I have ever met is man in his 40’s and he owns a big landscaping company. So I actually have a hard time imagining Piper on girl. I absolutely love the name but I am worried about “Peepee” taunts. I ADORE Piper. It is one of those names I have loved for years. It is musical without being over the top. I think in the next ten years this name will increase in popularity. 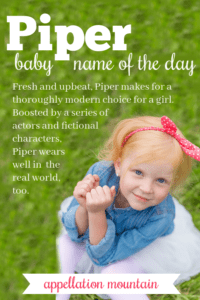 The nickname Pipes is adorable as a family nickname or for a little girl. Piper is bohemian, non-mainstream and fabulous. I don’t know how people can say the name is not feminine. I love it. Friends of ours have a 4 y.o. Piper – it wears very nicely! I am SO glad you think so as well! […] But while June is simple and home-spun, Juno has quite a bit of spark. […] it was said that the part-goat god Pan, the most famous flutist until the advent of the Pied Piper and Jethro Tull – made his home in Arcadia. […] were about baby names borrowed from Twilight.